This crust has a wonderful gourmet flavour because of this blend of nine herbs and spices. It is delicious with tomato or pesto sauce and all of your favourite toppings. (Some say it tastes so good that it doesn't even need sauce!) Or just bake and top with parmesan cheese for delicious bread sticks. You decide. This Pizza Crust is free of yeast and sugar, too! ALSO, it makes the most delicious coating for pan-fried chicken or fish! Just dredge in some Pizza Crust mix and pan fry until done. A sprinkle of salt right out of the pan and voila! Superb! Directions: Just add oil and water. 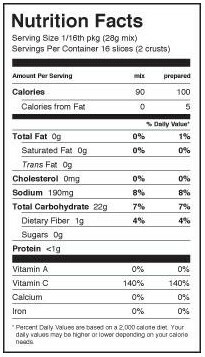 Ingredients: Brown rice flour, tapioca flour, arrowroot flour, xanthan gum, granulated garlic, cream of tartar, salt, baking soda, Italian seasoning, ascorbic acid. HAnds down one of the best homemade pizza doughs ever. Highly recommend. Nicely seasoned but it sure cooks up oddly. This is the best GF pizza crust mix - and it is enough to make two very large pizzas. It is chewy in a non- gf way (a real treat for those of us who can't eat gluten), and the blend of Italian herbs is just right. I used to always make my own, but usually use this as my go-to now! I had such high hopes/expectations for this product. Followed baking instructions but was disappointed with the end result. While it tastes good the seemingly raw, uncooked, chewy texture leaves much to be desired. Better off making bruschetta with gluten-free bread. Terrible! Did not bake properly and the dough is very watery. It seemed easy enough but it did not live up to its hype. Will not buy this again. Husband hated it. If you want to work the dough and get a big crust, that's not the one. It gives more a cake like dough before it's cooked. Great taste though. I did not like this dough, it was way too watery. The flavour was great. I noticed when overcooked it was a bit hard to chew. Other than that it was great- easy to make. I would buy this again. best gluten free pizza crust we've tried so far! Very good, will purchase again for sure! My family does not have problems with gluten but I like to use gluten free recipes sometimes. This pizza crust is really tasty and light. Highly recommended. This makes an excellent pizza crust, however I found the directions for baking much too long. I'm still experimenting but so far 15 minutes at 400F produces better results than 20 minutes at 450F. Amazing! Easy, and delicious! And my very picky husband likes it better than "normal" pizza crust! I was diagnosed a Celiac two years ago and I have to say ... I did miss Pizza! 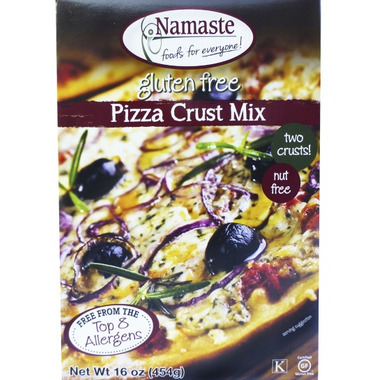 I do love this crust so please continue to carry this product as well as the entire Namaste Product Line! I never have to worry about cross contamination when I use these products. I am very sensitive to cross contamination and its nice "not to worry" about having a reaction using these products. Very easy to purchase this way and I'm able to keep stocked!!!! Loved it! So easy and tasty! Love it! Will continue using. Has a good flavor and texture. Really nice flavour and easy to make, I would buy it again. so good! It has a great, flavourful taste, perfect blend of herbs so that my son and I both enjoy it! Tastes great topped with oil and toppings, I ve also used it as a "crecent roll" and wrapped it around hot dogs, and recently made a simple bisquit with it an crumbled it for my sons stuffing at christmas-no spices necessary to be added! Love this product, my cupboard always has a bag! Hi like this product. Much better than the others and less allergy issues with their ingredients. Absolutely the best gluten free pizza crust I've tried! Easy to make, just add water and oil and you're ready to go!! Would highly recommend it!! Awsome product will buy again. Great gluten free pizza dough. The mix of spices in the mix give it a really good taste. Love it so much that I buy many packages at the same time. I make small pizza crusts and freeze them individually so when I want a pizza, I use it from frozen and it saves time! I think this is a great substitute for a pizza crust, as my son is off all wheat, gluten, casein and yeast. Trying to find a pizza crust recipe with no yeast is next to impossible. I like how simple it is, with just having to add water and oil to the mix. Our whole family eats it. It makes me want to try other products from this company!